Whenever I write about a restaurant, it's likely the result of inspiration and/or motivation (I know, "duh"). Usually I plan and research the restaurant that I want to review, as opposed to relying on happenstance. Sometimes though, fate directs me to places I wouldn't otherwise visit. With Havana's Pilon, that was somewhat the case for it was on my radar yet not a priority. However, because of certain circumstances (such as a water outage) at one of my favorite bars (Bardog Tavern), I got opportunities to try the Cuban restaurant. I took advantage of them in the hopes that it would live up to the hype. During my first visit to Havana's Pilon, I wasn't sure about what to order. In the back of my mind, I remembered reading about the Ropa Vieja, which is shredded beef in a tomato-based sauce with green olives and red and green peppers mixed in. By itself, the entrée had some flavor to it, but it didn't excite my senses. I'm not saying this as a criticism for I'm not knowledgeable in Cuban cuisine, but I expected something more exotic. The meat also lacked tenderness, for chewing it wasn't easy. Again, I'm saying this as a layman who becoming acquainted with Cuban food. Nonetheless, the Ropa Vieja is decent on its own, but it's much better with good side dishes. 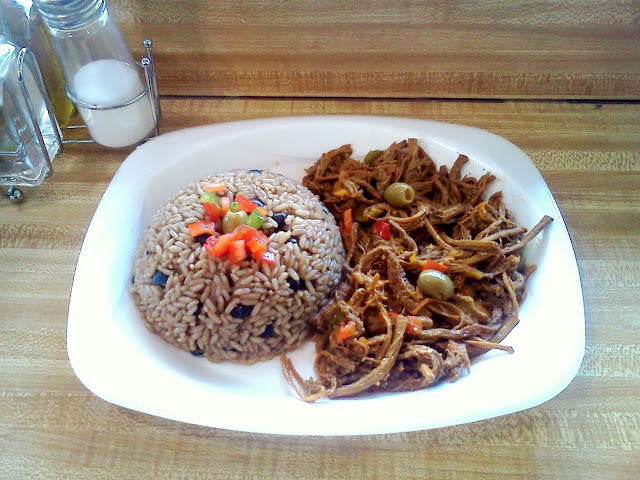 The sides that I got with the Ropa Vieja were recommendations from the restaurant's cashier. He suggested the red beans and rice as good matches for my entrée. Specifically, I got the Congri rice that was mildly seasoned and mixed with green olives and red and green peppers. For what it is, the rice is decent and (minus the other veggies) comparable to "dirty rice" served at many Soul Food, Cajun and Creole restaurants. On the other hand, the red beans were the saving grace of my lunch. Swimming in gravy seasoned with a bay leaf and other exciting herbs and spices (along with a big chunk of lard), the red beans are very good. Even after mixing it with the rice, the red beans provided enough zest to make my lunch a good one. I'm glad that I took the restaurant's advice, for it made a big difference in my first impression of it. Shortly after my initial visit to Havana's Pilon, my second experience was also an unintended consequence. Seeking a break from work, I headed over to Bardog despite bring lunch from home. I usually do this to see one of my favorite bartenders, Brittany. Unfortunately, she had the day off so I was less inclined to dine there. After looking over Bardog's specials, I decided to go back to work after making a brief stop at my bank's ATM. Doing this meant passing by Havana's Pilon, which I was anxious to try again. SIDE NOTE: Related to this review, I'm curious about something. 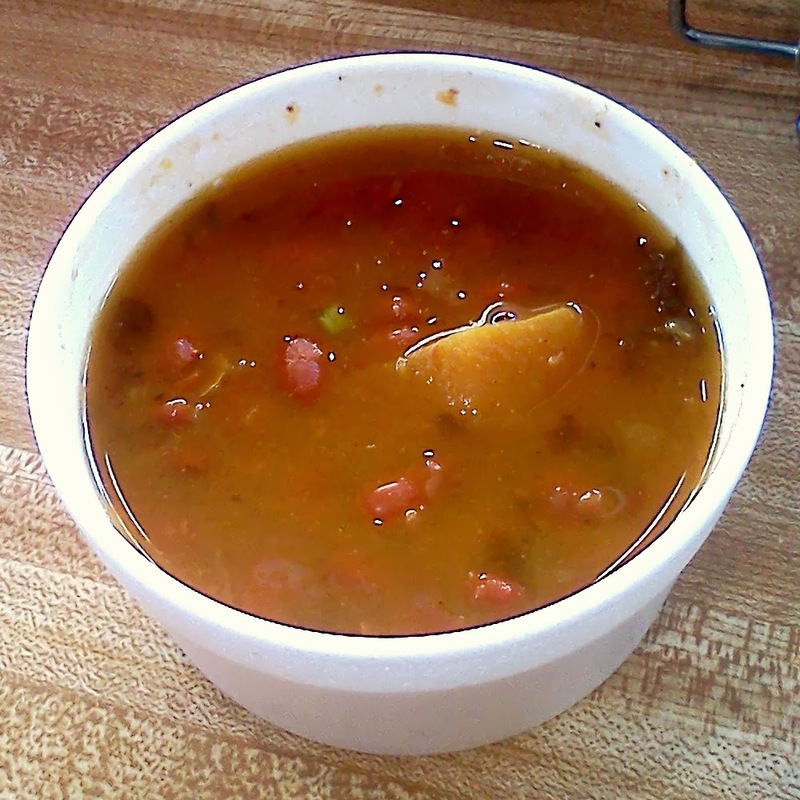 According to Wikipedia, "Pilón" is French for pestle and a Cuban form of dance. Does this mean that restaurant workers pound out the food while dancing a hot salsa? This time around, my choice of entrée was partially influenced by a fellow blogger that I respect a lot. After reading a review about empanadas written by Memphis Que, I decided to try some. My delicious choices were the ground beef, chicken and ham & cheese. The seasoned ground beef and chicken empanadas were very flavorful, stimulating my taste buds in ways that the Ropa Vieja didn't. The ham and cheese empanada was like a Hot Pocket on steroids. While the filling tasted very similar to the popular snack, the pastry’s crust enclosing it (along with the other empanadas) was superb. It was fluffy and flaky with a tinge of buttery flavor. Also, the restaurant didn't skimp on dough, for it used a lot of it to wrap the empanadas. 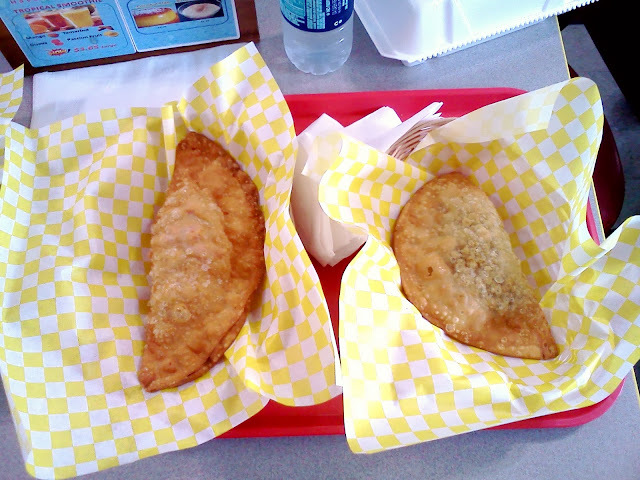 At $2.15 each ($3.15 for shrimp), two empanadas are more than enough to satisfy most appetites. With me eating three, I had more than I needed. So, despite not seeing one of my favorite bartenders, my lunch of great Latin food went extremely well. A little over a week later, I decided to get another empanada. Exhibiting my adventurous side, I chose the guava and cheese empanada. The pasty combines the tart sweetness of the guava with the sharp taste of the cheddar and cream cheeses and the buttery crust for a very delicious snack. It can also be a good dessert after eating a plate of Ropa Vieja or a sandwich. I'm glad I procrastinated about posting this review, because this tasty treat deserves the spotlight. SIDE NOTE: Please read Memphis Que's excellent review of the Cochon Heritage BBQ competition that took place August 30, 2013 at Beale Street Landing. If I can add to that, the Memphis McRib Sandwich from Central BBQ was a gourmet masterpiece. The slaw in it was perfect, for had a nice sweet flavor with very little mayonnaise and/or buttermilk (I didn't sense any). The pulled pork and BBQ sauce was perfect too, making for a great sandwich. Comparing it to McDonald's McRib Sandwich, Central's version is a direct opposite of it when it comes to quality. With Central (along with the other Cochon competitors) using Newman Farm's Berkshire Pork, quality meat that even the dumbest of rubes can see that it's better than processed meats. Also, I want to give shout-outs to Travis Grimes of Husk Restaurant (winner of the event) and the St. Jude Culinary Team (aka "300 Mile BBQ") for a very impressive showing that included barbecue oysters. I can go on and on about this event, but I won't because it's unrelated to this review. SIDE NOTE: On a related topic (to Havana's Pilon), when I finally got to see Brittany at Bardog, one of the daily specials was... wait for it... Cuban sliders. Similar to the Cuban sandwich, the sliders consisted of pork tenderloin, ham, provolone cheese, mayo and pickles that combined for another great creation (sort of) from Chef John Haley. You would think that a pork tenderloin and ham sandwich would've originated in the Mid-South as opposed to South Florida, but apparently no single culture can hog the swine. Personally, I enjoyed both the sliders and the service provided. 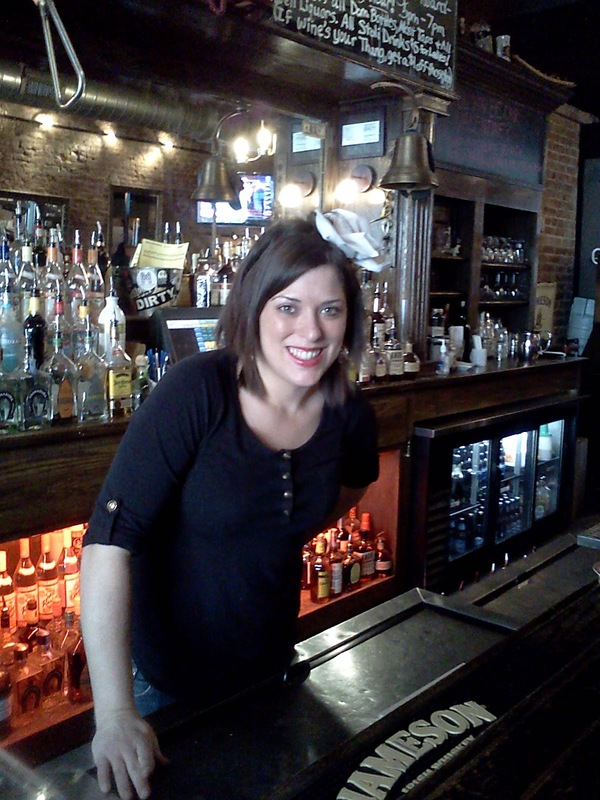 Because of Brittany's charm and personality, I will always be a frequent regular of Bardog. Her smile alone gives me a boost, especially on days when I need something cheerful. Aldo Dean is lucky to have Brittany working for him. Speaking of Aldo (and completely unrelated to this review), I ran into more good fortune on the same day that I had the Cuban sliders. As I passed Aldo's Pizza Pies on my way back to work, I saw a familiar face among the servers there. The person was one of my favorite bartenders from the past. Alyssa, formerly of Lolo's Table, was always a joy to see whenever I visited the currently closed restaurant. Like Brittany, Alyssa is quite charming with a beautiful smile and a cool demeanor that makes a person feel very comfortable. Other than Bardog and the Flying Saucer (who has a great bartender/server in Kelly), Lolo's was my top destination for casual drinking. I'm glad to see Alyssa at Aldo's (on Wednesdays during the day), for it gives me another reason to patronize the pizza joint. By the way, even though I have "favorites," I have a lot of respect for nearly all the bartenders and servers at my favorite bars and restaurants. They work hard and do a great job serving me.